A dolphin-spotting trip to the Black Isle led to this image of a weeks old bottlenose dolphin leaping from the sea with two adults. John Orr, who works for Scottish Natural Heritage (SNH), took the photograph from Chanonry Point, on the Moray Firth near Fortrose. One of the adult dolphins is thought to have been the calf's mother. 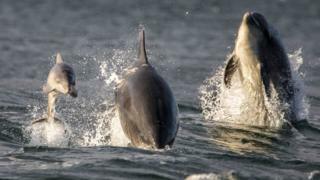 SNH photographer Lorne Gill said: "It's never easy to capture leaping dolphins at Chanonry Point even on really good occasions when you may be lucky enough to see many of them leaping close by. "They randomly appear with a sudden burst of energy from the deep, making it difficult to know where to look. "John has done extremely well to capture not just one but a trio of leaping dolphins, including a rarely seen young calf, beautifully framed and looking straight at his camera. "He should be delighted with his photograph as I know I am."